X-Wing Squadron Kickstarter project: Does crowdfunding need to become more serious? Fear not, sons and daughters of the rebellion! 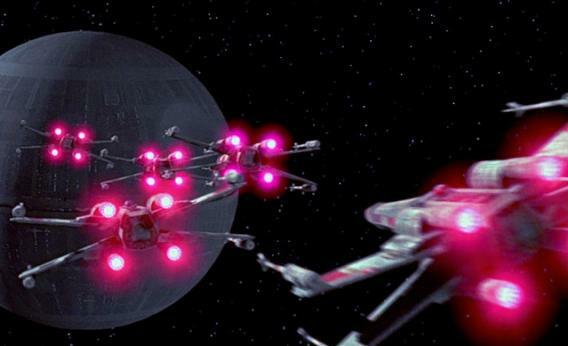 A new Kickstarter project promises to raise enough money to build a squadron of “proton torpedo armed X-Wing fighters” to ward off the impending construction of a crowdfunded Deathstar! At the $10,000 backer level, you’ll even get training by Yoda himself—a steal. Like most of you, I thought it was funny when folks first hijacked the White House’s petition program to ask for a functioning planet killer. I then reveled in the PR acumen displayed by Paul Shawcross, chief of the Science and Space Branch at the White House Office of Management and Budget, who shrewdly used the whole charade as an opportunity to give press to all the banging science our government does sponsor. But when the Empire struck back and turned to Kickstarter for its funding, the gag was feeling a little less like The Simpsons: Season 4 and more like The Simpsons: Season Oh God Kill It With Fire. Now that there’s a fictional Kickstarter to combat that other fictional Kickstarter, is it time to question whether the crowd-funding platform has jumped the Rancor? At the very least, one has to assume all that mob energy could be better directed. While Reddit has more than a few unsavory corners, its readers have also subsidized projects ranging from infrastructure building in far-off lands to medical relief for Acts of God. Even the Chive, a site known as much for its scantily clad women as its Internet videos, has a powerful and productive charity arm. Don’t get me wrong, Kickstarter has facilitated all sorts of awesome. It’s just that this intergalactic escalation of hypothetical arms seems sort of silly when you consider that the X-Wings have $217,000 pledged, the Deathstar $350,000, and there are kids starving in, well, pretty much everywhere. I know, I know—it’s a joke. The projects won’t hit their multimillion-dollar targets, and the backers’ money will never be charged. But the joke is getting old. The Deathstar petition caused the White House to quadruple the signature limit, making it more difficult for smaller, less gimmicky petitions to get through. Could the dueling campaigns have a similar effect on Kickstarter? The point is, it’s either time to harness the power of the Crowdfunded Star Wars Thingie Movement toward some purpose or let the campaigns self-destruct without more than a ceremonial Wookie whimper.